It’s getting to the end of our visit to Italy and we were trying to decide on an outing. We are lucky that the autumnal weather has been kind to us and we find yet another day of mild sunshine. The holy city of Assisi lies less than two hours to our west in the beautiful Umbrian countryside and is a favourite place to visit, and so it was on this occasion. We have visited Assisi many times and always marvel at the intense spiritual atmosphere in the tomb of St Francis. We could sit there for hours bathing in the celestial energy that permeates the place. Even in the midst of many people coming to and fro through the tomb the atmosphere is never disturbed. It’s a very special place. 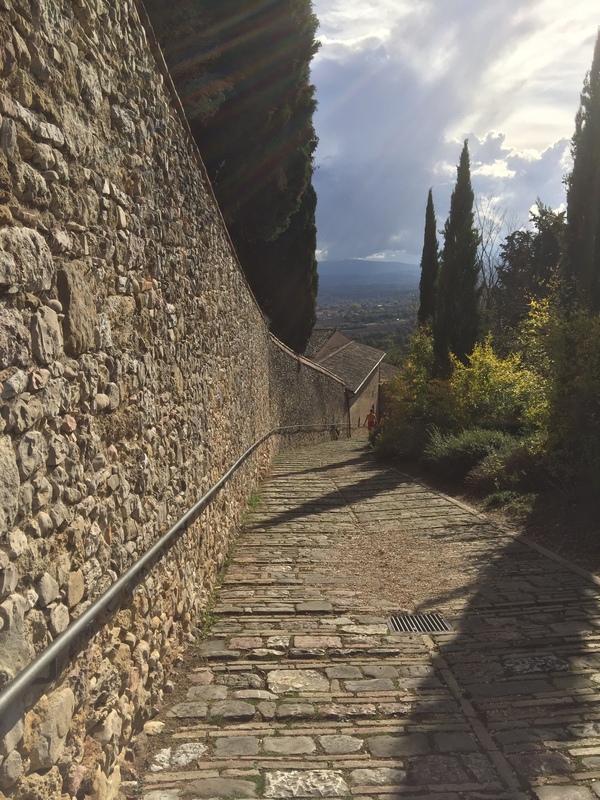 On this occasion, we have decided to start our visit to Assisi with a new location. 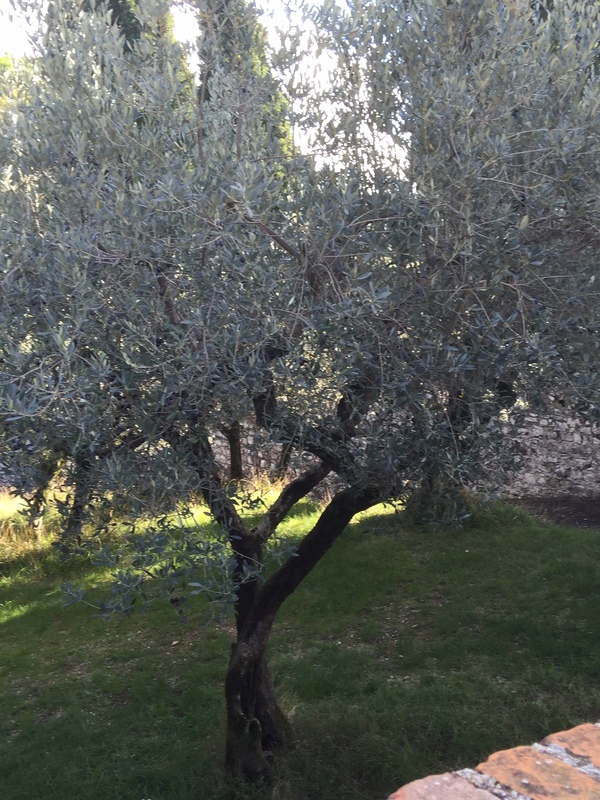 Inspired by a story I heard Dr Wayne Dyer tell in his film ‘The Shift’ ( well worth seeing if you haven’t already), we have decided to visit San Damiano just outside the hustle and bustle of Assisi surrounded by olive groves and with the most beautiful views over the Spoleto Valley. Dr Dyer, who passed away just two months ago, tells of a miracle he experienced at this convent and Church when St Francis appeared to him, at a moment of crisis, and healed a long-standing problem he had with his knee. It’s a great story and one you will find in the film in detail. But suffice to say, being both a fan of Wayne Dyer and St Francis, it seemed like a really good opportunity to visit this magical place. 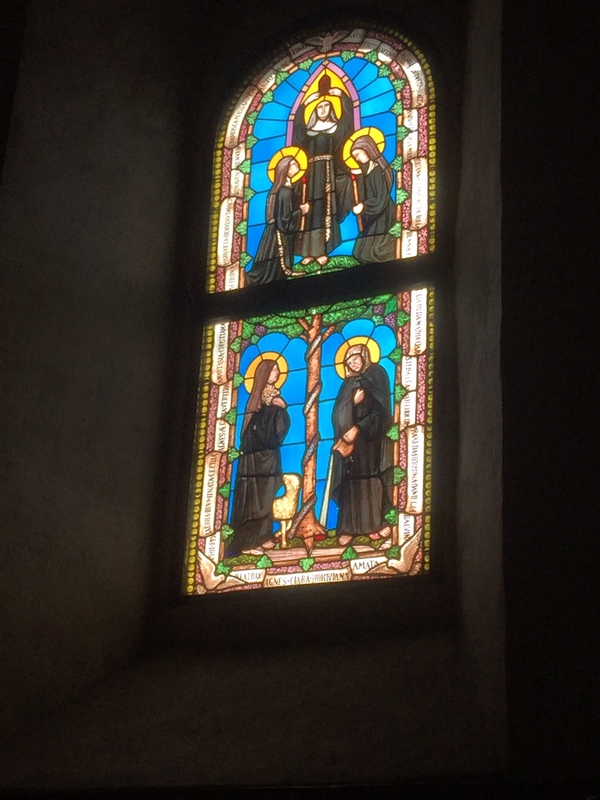 Despite this close connection to St Francis, San Damiano is really celebrated for its other famous inhabitant, Saint Clare. Saint Clare was a close friend and follower of Saint Francis and she founded her order of the Poor Clares here in 1212. Saint Clare remained here until her death in 1253. This is a small, intimate site in a beautiful setting. Visiting out of season, as we were, the car park was almost empty when we arrived. Walking a few steps into the grounds of the church and convent we were met by a large group of nuns who were waiting for San Damiano to reopen after lunch. Despite the signs all around telling us that this was a sacred site and silence should be maintained at all times the nuns were busily praying aloud. Seated at opposite sides of the small piazza they exchanged prayers. Well, most of them did. Some of them were too busy using their mobile phones to take photos of the lovely buildings. I suspect these particular nuns were not part of the order of the Poor Clares. I don’t suppose anyone would have the nerve to tell praying nuns to shhh! I was a little tempted. One of the many lovely things about this church and convent is the size, and the fact that much of it is unchanged from St Clare’s time. In the church is a copy of the painted crucifix that spoke to St Francis. The choir room still has the old wooden stalls from the 13th century, but it’s all on a small scale. The simple dormitory is a large empty room where the Clares slept together on straw mats. A basket of flowers and a cross mark the spot where Saint Clare would sleep and indeed where she died in 1253. 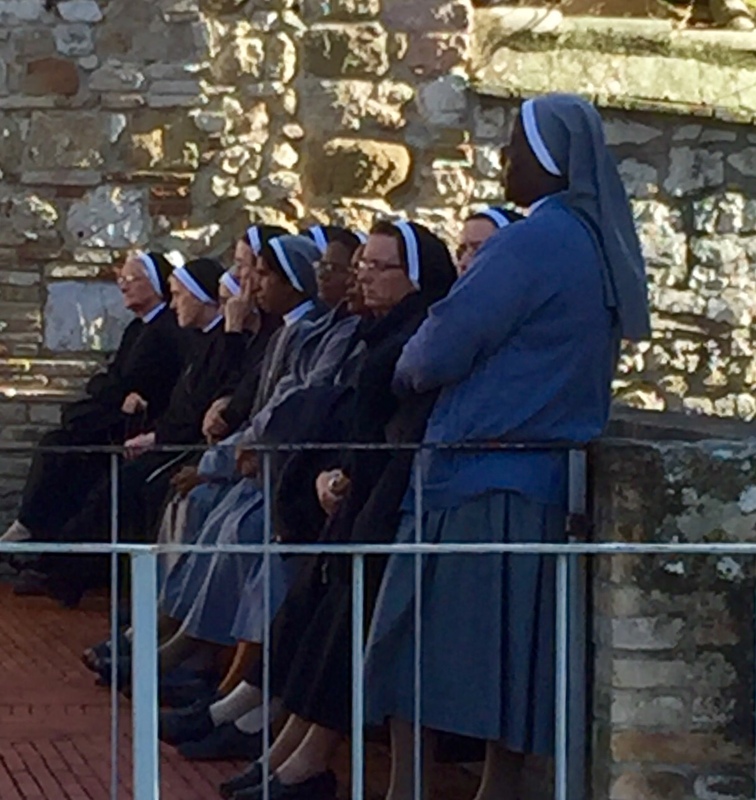 The visiting nuns, moving as a pack, took over the church while one of them read the little guide to the others. The church was very dark so this was done by the light of a mobile phone proffered by one of the other nuns. We sat in the pews and closed our eyes to meditate. It’s a good job that noise is no barrier to practising Transcendental Meditation, again I wasn’t sure of the etiquette of asking nuns to keep the noise down in a church. The power of Clare’s authority and prayer is demonstrated in the stories of how she was able to defend the convent from marauding Saracens in 1240 and again from Imperial soldiers guided by Vitale of Aversa in 1241. This latter date is still celebrated in Assis each year on 22nd June with the Festa del Voto – Feast of the Promise. It was very easy for me to imagine the nuns going about their business in this lovely setting amongst the olive groves and charming cloister. No doubt at this time of year they would have been engaged in the olive harvest as are people all over Italy at the moment. Over the centuries, some things don’t change. I will be returning to Italy next week to harvest my own olives in much the same way as the Poor Clares would have done 800 years ago. Though I won’t be sleeping on a straw mat. 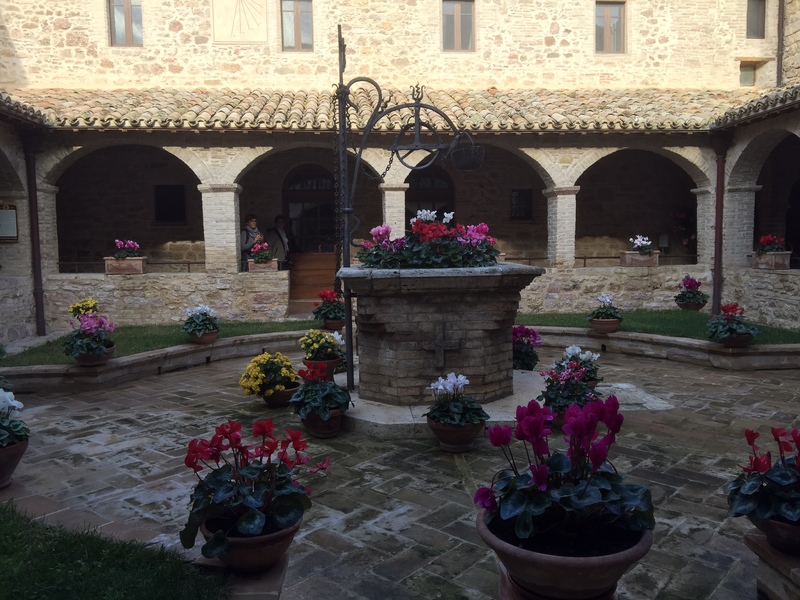 San Damiano is really worth a visit if you are planning a trip to Assisi. Of course, we couldn’t resist visiting the tomb of Saint Francis again before we returned home. A day steeped in profound peace and modern day nuns!